How can I revamp some plain curtains with recycled/upcycled materials? | How can I recycle this? How about adding pockets to them and putting in small treasures? Little cuddly toys peeping out or mysterious letters or old maps tucked in… The pockets would be easy to decorate before adding to the curtain and make a portable project to take with you. Odd fringes appeal to me too… do you have keys that you’ve no further use for? Or other things which would jangle when moved? You could weave an inkle band (no need for the loom if you don’t have one – just do a back-strap version – Laverne will show you how here http://backstrapweaving.wordpress.com/) and sew the strips in strategic places. You could also leave the curtain itself relatively un-touched, but accent it with home-made kumihimo tie backs. Use chunky wild “rope” like yarns & . . .well “rope” and you could really get creative. Indeed with both of these possibilities you can incorportate beads and baubles then accent the curtain by randomly sewing them onto the curtain fabric itself. What about tie-dyeing the curtains? It may not be possible depending on the fabric or whatever it has been treated with. Alternatively you could get scary. 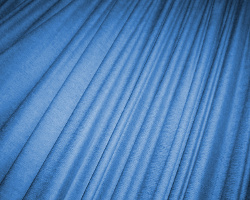 If you’ve got sheers behind the curtain. You could cut out geometric shapes, like children do with paper snowflakes, or a more planned version using arabesque geometric patterns or art Nouveau patterns. Again depending on the fabric, you might need to consider treating the cut edges. I’ve done this with 2 pairs of curtains. One set was beige. I dyed them light blue, then threaded matching sets of coloured beads onto embroidery thread (cos Ihad some!) and with one single stab of the needle, attached each beaded thread to the curtain, tied it at the back et voila, dangly beads all along the top. I also embroidered the bottom with a herringbone pattern. The other curtain I made myself from 2 bright yellow cotton bedspreads and some lining. The curtain covers the whole wall with the front door, so it is loooong! I cut one spread & stitched it to the other to make the right size. I flipped the tassled ends over so they made a decorative feature, plus some red ribbon along the folds. Finally I lined the whole thing to hang well. Fair bit of sewing, but I didn’t have to buy anything, and it is a pretty, dramatic, draught-stopping curtain. have fun, use up whatever bits you have! Glue on them poker chips.